Magdeburger Joe.com: "Al Gore Is An Idiot" Weather in Copenhagen"
I have noted a strange sensation that I will describe as "inner warming". It is as follows. Today I was going on a ten mile motorcycle ride to my son's graduation. It was about 20 degrees out. Even with gloves on, I felt like my fingers had been slammed in a car door. People looked out their car windows at me like I was a strange man on the subway talking to himself and getting into an argument. Despite the bitter cold, multiplied by an insane wind chill factor, I felt a sense of serene happiness. Aside from having raised a son to adulthood who is a far better student than I was, the thought that a Greater Hand has been thumbing His Nose at all the talk on global warming puts a smile behind the chilly confines of my motorcycle helmet. Somewhere in the city, someone is probably asking for a book on global warming and bursting into insane laughter as a bitter cold wind howls outside. When I got home, after a cup of tea and enough diet food to make me gain five pounds, I started scanning the news about all of the blowhards at the global warming conference. Bloomberg News made my day with the following report. "World leaders flying into Copenhagen today to discuss a solution to global warming will first face freezing weather as a blizzard dumped 10 centimeters (4 inches) of snow on the Danish capital overnight. There is actually a scientific definition to the term "White Christmas". According to the scientific definition, 90% of a country has to be covered by at least 2 centimeters of snow on December 24. According to this definition, Denmark, which is enjoys a more temperate climate than the rest of Scandinavia, has not had a "white Christmas in 14 years. If you want theater tickets, you speak to your hotel concierge. But if you want suitable weather for your big event, all you can do is pray. "Climate control" is a delusion found on psychiatric wards and in universities. People can tread softly and try not to pollute, but the only warmth you can really sustain is in your home and in your heart. Tomorrow morning in New York City is expected to be bitter cold. But when I leave for work in the darkness of early morning a simple thought will play in my head. It will make me feel warm and happy inside. 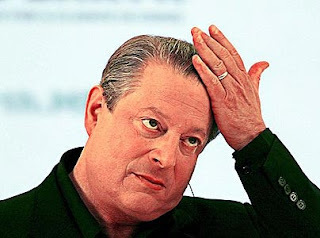 "Al Gore is an idiot !"